When I was contacted by Mont Bleu about reviewing some of their Design Glassware crystal glass nail files I was happy but skeptical - happy for the opportunity, but skeptical because me and glass nail files don't really go well together and I didn't believe I would like them. The ones I'd gotten in the past didn't seem to have any grit which was a deal breaker for me (even though I loved the idea of being able to use them forever and having to just rinse them off to clear them off). Now that I've tried these ones from Mont Bleu all I can say is: I AM SO HAPPY I TRIED THEM. They are leaps and bounds above my previous Revlon one. And they are stunning to look at. 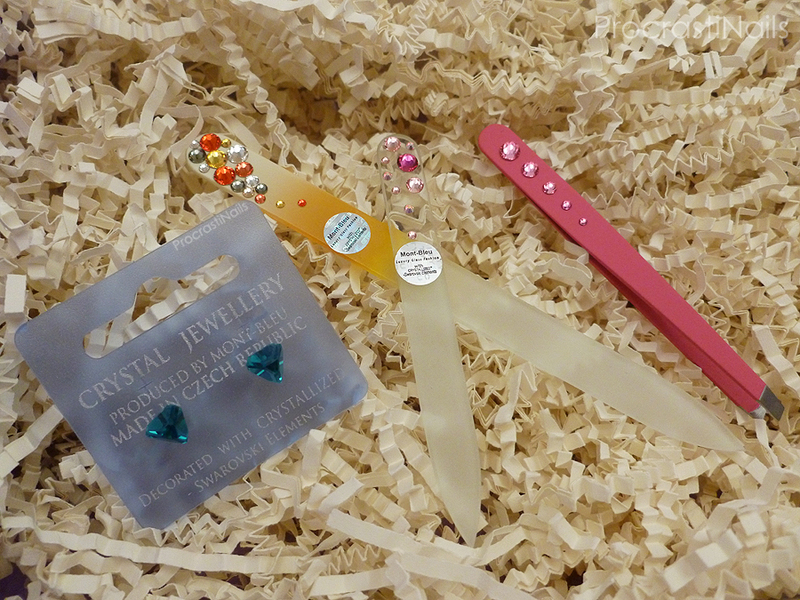 On top of the files they also sent me some tweezers and a pair of earrings (lovely!) and I am 100% satisfied with all of them. 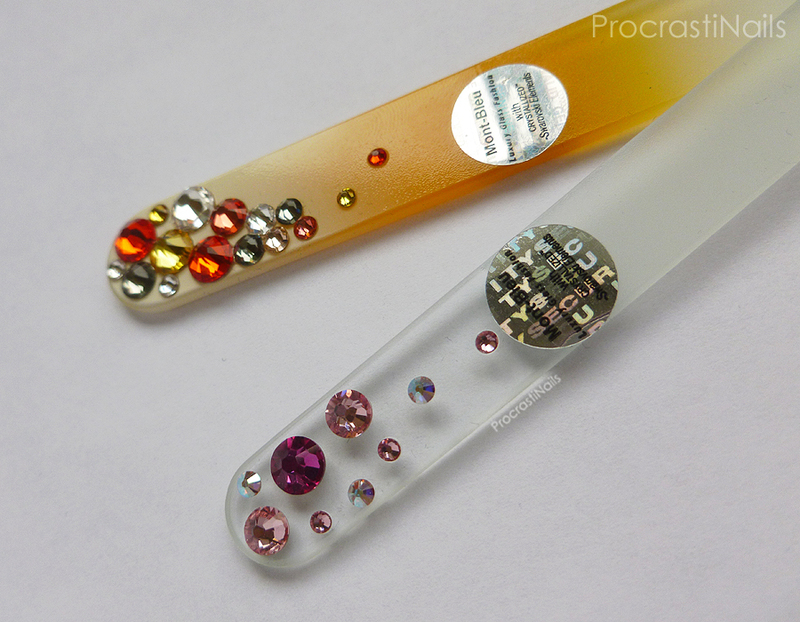 Seriously - if you've been unsure about the idea of glass nail files in the past this is the brand to start with. I'm a believer. These are the best glass files on the market in my opinion. Mont Bleu creates a number of nail and cosmetic items, and after asking around in my nail polish group I've learned that they have a very enthusiastic and satisfied fan base. Their products are great quality, and a lot of their items come hand decorated with Swarovski® Elements. The first item they sent me was Swarovski crystal nail file BC-M2 (in Bubbles Color - Orange), which is a stunning yellow and orange nail file. It's full-sized at 135mm (5.32 inches) and includes those Swarovski® Elements I mentioned earlier. I love the white and yellow gradient that's on the base, it really lets the colours in the crystals pop! Along with the full-sized file they sent me Mini nail file W-S1 (in Waterfall Clear- Fuchsia). Isn't this so cute?! It's the perfect size to slip into my purse for emergencies. It's made of clear Czech hardened glass and is decorated with pink and clear Swarovski® Elements crystals that catch the light wonderfully. Both of these files work amazingly and have a different grit on each side. 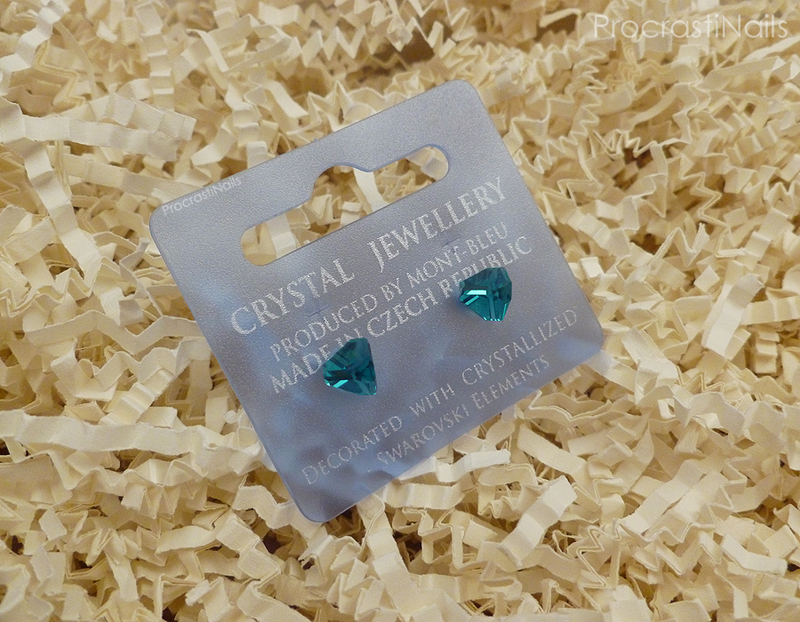 The last item that Mont Bleu sent me was a real surprise - earrings! They're so lovely. The pictures I took don't do them justice at all! They're hand made with Swarovski® Elements crystals (8mm) and non allergic metal (rhodium), and they're a gorgeous sunny sky blue. The exact set I was sent were Blue stud earrings EMB 13.2. Mont Bleu has a whole range of cosmetic items from nail files to compact mirrors to jewellery to brushes. As I mentioned earlier a lot of their items are hand decorated with Swarovski® Elements and they're just stunning. Each item came in it's own black velvet pouch which was a lovely touch. They have worldwide guaranteed shipment, free shipping over $50 and their prices are really reasonable (especially for the quality you're receiving). Let me know if you're thinking about picking any of their products up for yourself (or if you already have some)! Nice review! They have some pretty glass files and other products too. Yeah, their products are really lovely. :) Thanks Lisa! Make sure you get a good one (like one of these) for your first, though. My first was a Revlon one that didn't really work to well, so I had written the product off completely until now. It's also really important to file just in one direction with a glass file - if you saw it across your nails (which we shouldn't be doing anyway) it won't seem like it's doing much filing.